Some businesses try to take advantage of fake Yelp reviews in order to enhance their Yelp listing’s reputation and exposure. This is a bad idea. Especially when you consider the fact that Yelp has a sophisticated system in place that easily detects fake reviews and punishes the businesses that use it. If you don’t already know about fake Yelp reviews, then consider this your one and only guide on the matter. We’ll also show you how Yelp’s review system works and how to report fake reviews to Yelp’s moderating team. Yelp’s strongest defense against fake reviews is its internal review system, which scours every review in order to separate legitimate forms of feedback from false reviews. The company isn’t entirely clear on how the review system works, but it did say that the system “finds” fake reviews using multiple factors such as looking at multiple reviews that come from the same computer or if the review shows apparent bias in the text. Yelp’s system also looks for solicited reviews because they’re also considered to be a violation of Yelp’s guidelines. The general rule of thumb for Yelp reviews is that they should come as a result of a customer’s genuine positive or negative experience, which means that you shouldn’t ask customers to leave a review on Yelp. Listings with fake or solicited reviews will suffer a search ranking penalty on the website. If it continues or even escalates, Yelp will put a “Consumer Alert” warning on that listing’s review section to inform users that the business is using fake or solicited reviews to stand out. However, the alert and ranking punishments aren’t permanent. Yelp will remove both penalties from a listing after 90 days as long as the review system doesn’t find additional issues with any recent reviews. That same system is also in charge of dictating which reviews show up on a listing’s “Recommended” reviews section, which is updated on a daily basis. Factors that determine if a review is “Recommended” includes its overall quality, reliability, and the user’s overall activity. According to Yelp, 72 percent of all reviews on the site are “Recommended. Another way that a review is marked as “Not Recommended” is if it becomes a lengthy rant against the business. 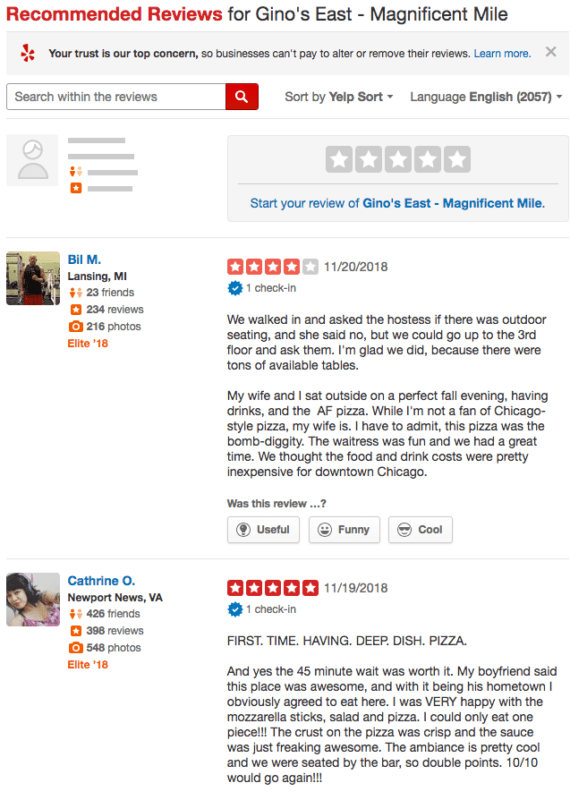 According to Yelp, these long reviews don’t accurately depict the customer’s experience. A review that is “Not Recommended” will still show up on a listing, but it doesn’t factor in the business’ overall rating. You can find these reviews by clicking on a link at the bottom of the page. Yelp’s review system is highly effective at finding fake reviews, but you can also help out by reporting any reviews that you deem to be false. Go to the “Reviews” section of your Yelp for Business Owner’s account page. Find the review and click on the button with three dots. Yelp moderators will take a look at the review in question and evaluate it against Yelp’s Content Guidelines. The process will take several and you’ll get notified of the moderators’ decision by email. You can also report reviews through the Yelp for Business Owners app on your mobile device. People have to be able to trust that the reviews they are reading online are genuine. If reputable sites begin to get bogged down by fake reviews then they lose their credibility. That is why it is also important to trust that these sites have a system in place to make sure their reviews can be trusted.